FIFA Street Review: EA Sports has revived the FIFA sub franchise with the new FIFA Street release hitting heights that its predecessors failed to reach. Following a number of years offering up the beautiful game in an increasingly beautiful, and PES toppling manner, EA Sports has returned to the grittier side of the world's sport reviving the previously laid to rest FIFA Street franchise. Having set itself an extremely high bar in terms of quality following the dominant and highly addictive FIFA 12 release late last year, FIFA Street has touched down for PS3 and Xbox 360 with the urban based dawn of showman soccer failing to live up to expectation. More stilted than its market leading full pitch sibling, FIFA Street sees gamers trot the world in a variety of street football stops with a selection of gameplay modes and a flurry of iconic environments playing host to a less than fluid and seamless football experience. Whilst graphics are impressive and the selection of pitches offer an aesthetically pleasing backdrop to the world of street football, the EA Sports offering lacks the final spark needed to turn what is undeniably an impressive game into one that will turn into an instant classic. 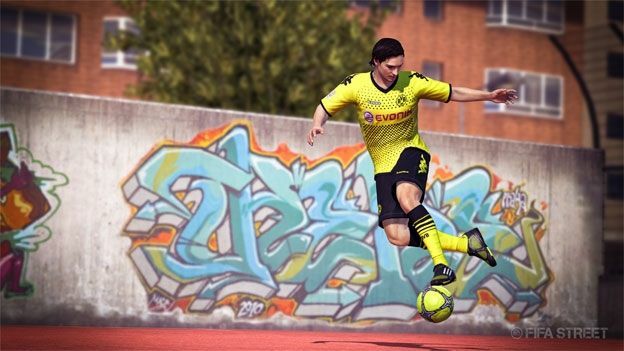 With 5-on-5 games allowing for the most traditional version of the street game, FIFA Street is filled with a number of fully customisable game modes that elongate the game's longevity and keep the title fresh and engaging for a longer period of time. Starting from 1-1 match ups gamers can select number of players per match as well as if the winner is determined by the most goals scored, skill points accumulated or even points garnered by nutmegs made. Packing this into a globe trotting experience, the FIFA Street career mode, dubbed World Tour, takes gamers through all gameplay modes in an easy to follow, award providing manner. One of the most impressive gameplay features in FIFA Street, the selection of surface types - from concrete car park to Astroturf pitches and hardwood sports courts - all have different, and ultra realistic effects on how the ball runs, bounces and is controlled by the player. While the controls are relatively intuitive to any fan of the full blown FIFA franchise, there can at times be a short but certainly noticeable delay with inputting commands and the moves, shots, passes and runs being replicated in an in-game form. This momentary lag becomes infuriating in a short space of time with the close quarters competition often seeing an intermittently delayed move result in a missed chance of goal or yet another unconvincing tackle or coming together of players. Despite having more than 50 skill moves, the right stick input command method makes mastering all of these a hard task. With such fine differences between the button configurations needed to perform different tricks it is difficult to differentiate between desired movements in the heat of the moment. Like the full FIFA release, Street is a game that will keep you entertained and striving for success when accompanied by a group of friends, a crate of beer and a lads night in mentality to Saturday evening. Unlike its illustrious sibling, however, the game is unlikely to keep users returning time and time again when playing on their own with short, snappy trick based rendition of football lacking the true addictive nature of its complete counterpart. Despite a number of niggles with the title's gameplay fluidity, with more than 50 new moves the latest FIFA Street offering is far superior to any of its urban based predecessor but not quite a match for its full FIFA counterpart.